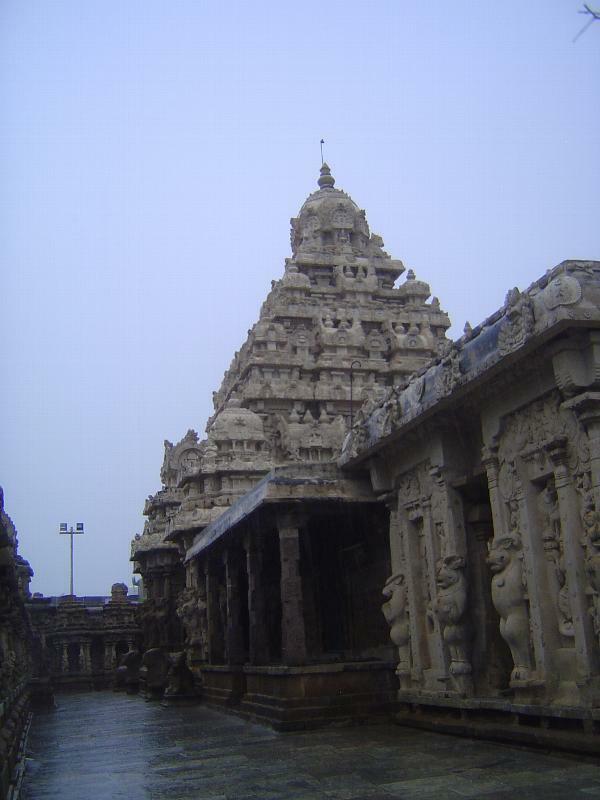 This temple, built by the same Rajasimha responsible for many if not all of the monuments at Mamallapuram, has been described (for example, by O.C. Gangoly in The Art of the Pallavas, 1957) as the culmination of the Pallava style. 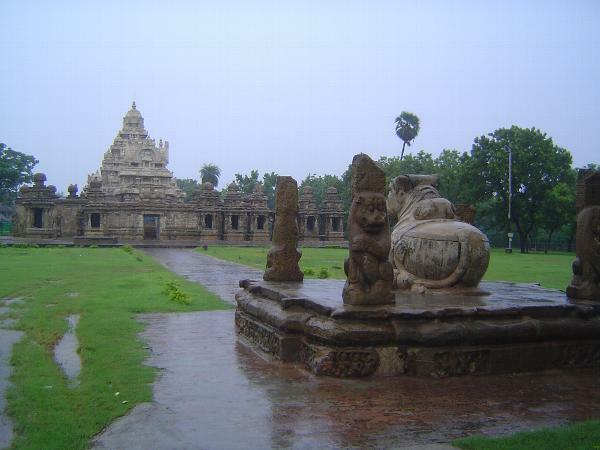 The form is close to that of Mamallapuram's Shore Temple but executed on a larger scale. An inscription in the central shrine says that the temple was not only built by Rajasimha but named by him for himself: Rajasimhesvara. And to think that I sometimes complain about donor walls in hospitals. 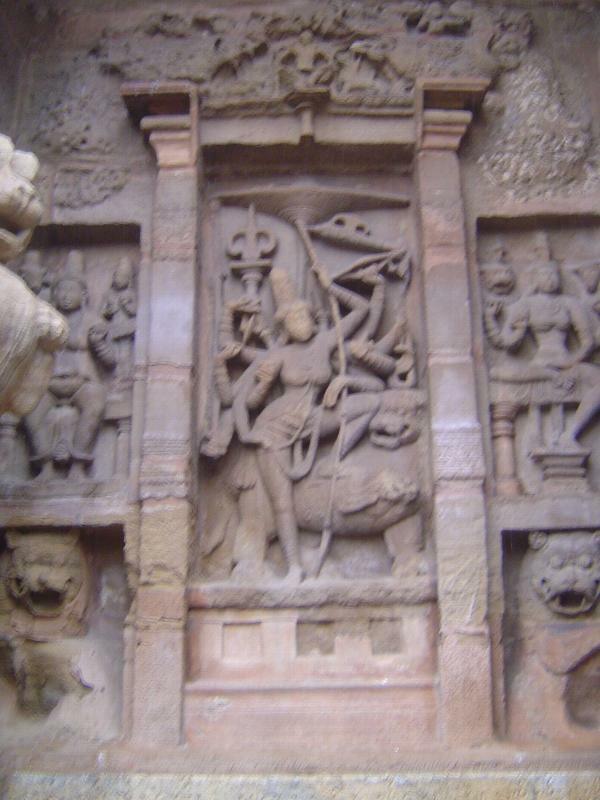 The bull parked just to the east of the temple is Nandi, Shiva's vehicle, so this is a Shiva temple. Nothing could be commoner than another Shiva temple, but this one has a plethora of small Shiva temples built into its periphery. Several are visible here, lined up to the right of the entrance. They constitute a unique visual dictionary of Shiva's many forms. 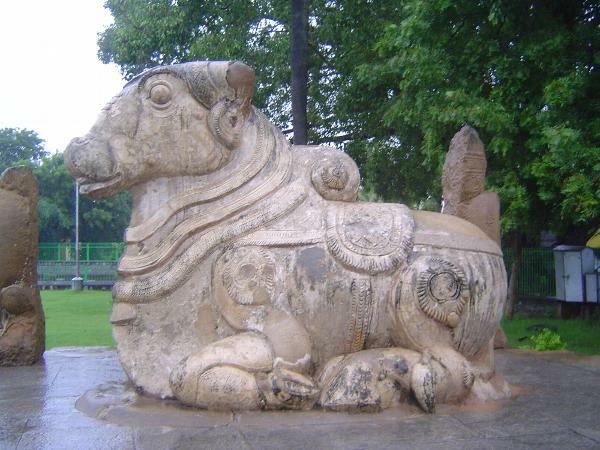 Nandi (recently repaired) is not unlike a figure on a carousel. The pillars on either side suggest that a roof must have existed or at least been planned. 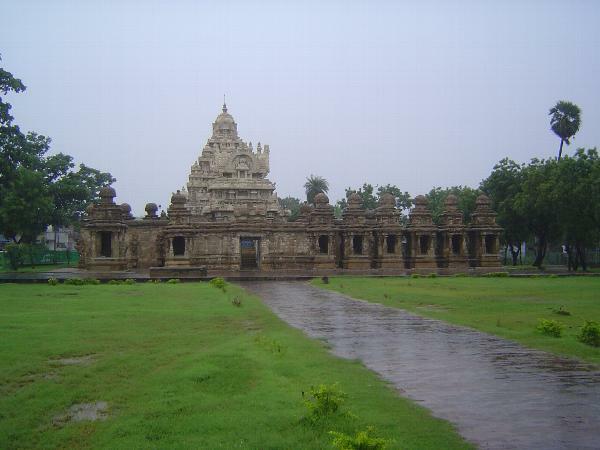 The entrance, with the mandapa or covered porch rising beyond. 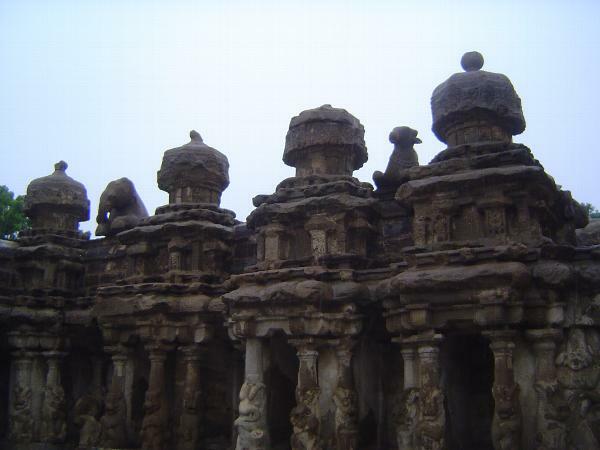 The flat-topped mandapa is rimmed by rampant lions, markers of the Rajasimhesvara Style. The rock is sandstone except for the interior columns, which are granite. The granite looks new (thank the restorers), but it's the same age as the main structure. Restoration can be tricky, but these stone carvings were originally covered with plaster to hide the joints in the sandstone blocks. How many times they've been replastered is a nice question, but in the 1920s Albert Henry Longhurst of the Archaeological Survey of India wrote that "a vast number of the larger figures and bas-relief panels decorating the central shrine and attendant buildings were extensively renovated less than ten years ago. 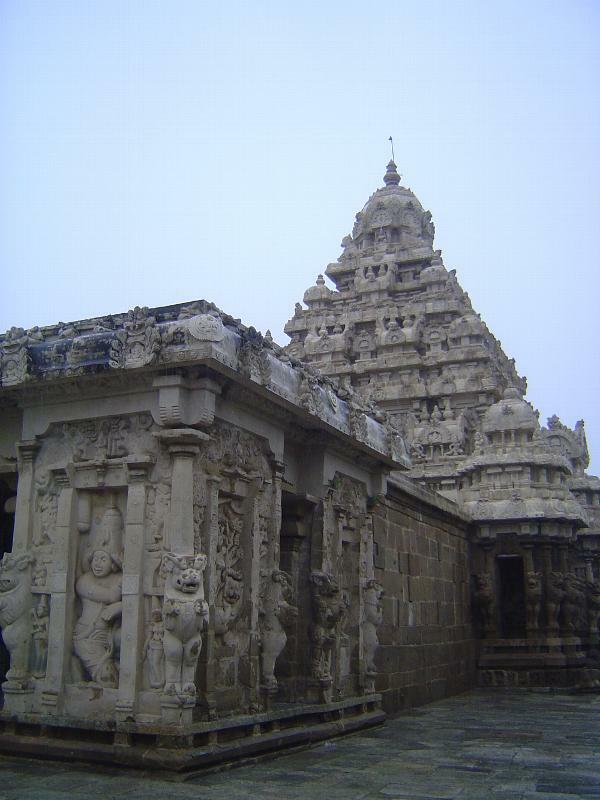 Whether this modern work is inferior to the original, I cannot say, but it is certainly of no particular artistic merit and the temple and surrounding buildings are spoilt by over ornamentation, every available space being covered with crudely executed plaster figures and reliefs depicting Siva in his numerous manifestations in bewildering confusion" (Pallava Architecture, pt.3, p. 13). 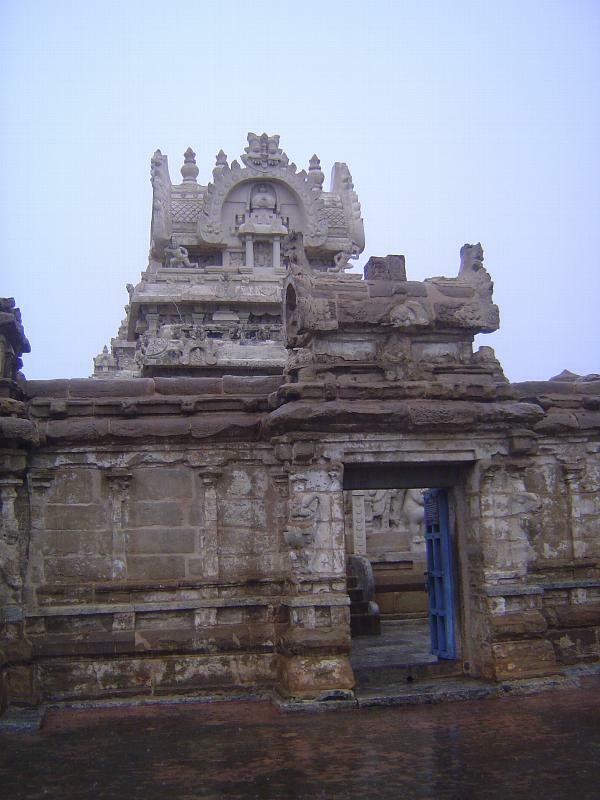 The porch was connected to the mountainous vimana at a late date. The entrance to the main shrine is in this connecting addition. 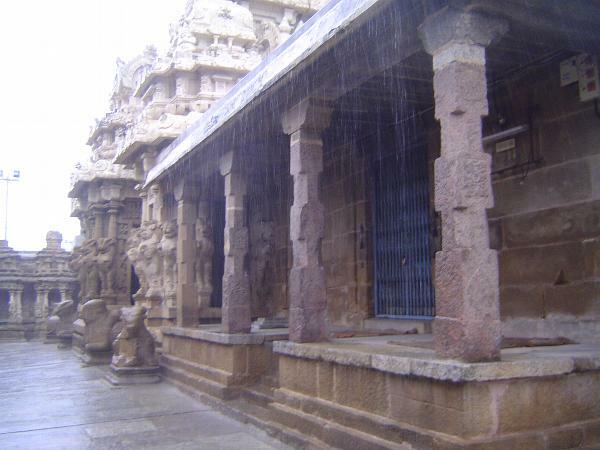 Longhurst didn't mince words when he wrote that "immediately in front of the Rajasimhesvara temple is an ancient pillared hall or mandapa, connected with the former by an unsightly modern apartment with an entrance on the south side" (pt. 3, p. 11, 1930). The rain's not so bad, but the place is locked up. Here we focus on the side temples seen while standing on the steps in the previous picture. 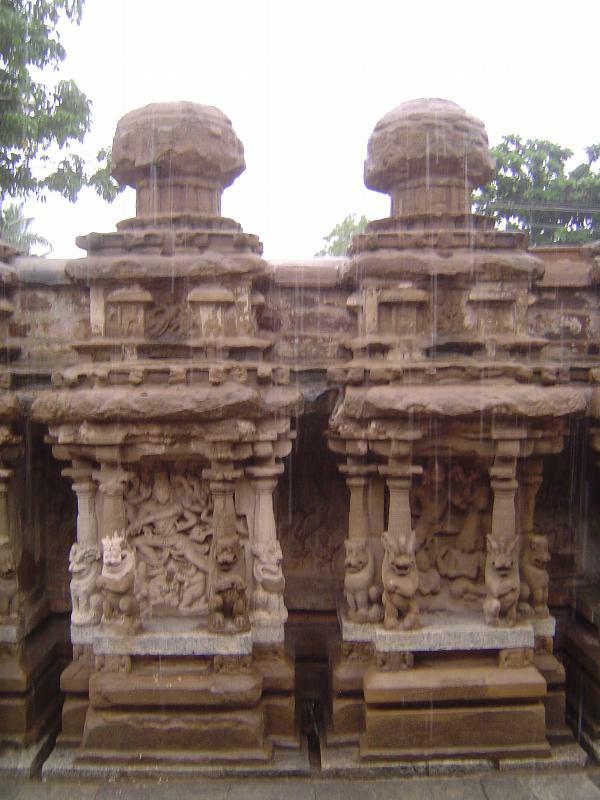 Each has a lila-murti of Shiva, or an image of one of his many forms. Each shrine is crowned with a stupika. 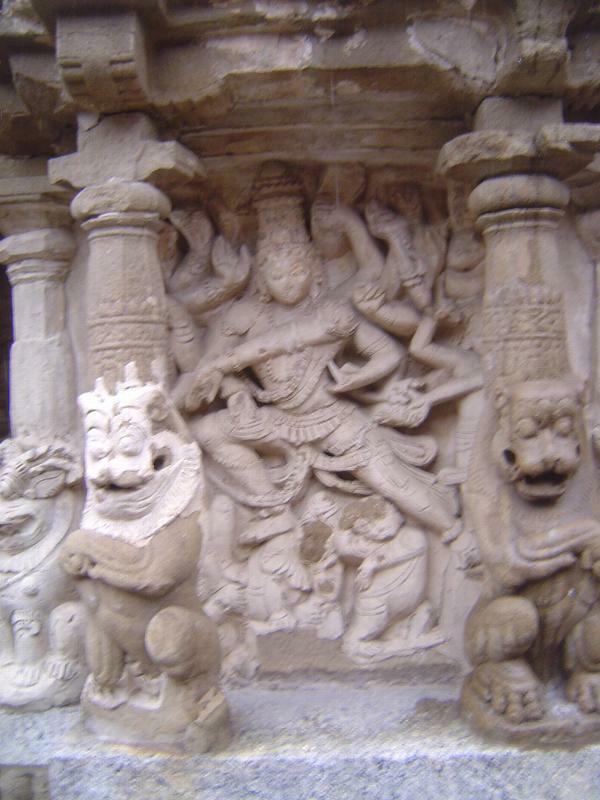 Longhurst wrote that this "vast collection of Saiva deities, symbols and legends depicted in the bas-reliefs must be quite the largest and most complete in India." K.R. Srinivasan has made a list of them. 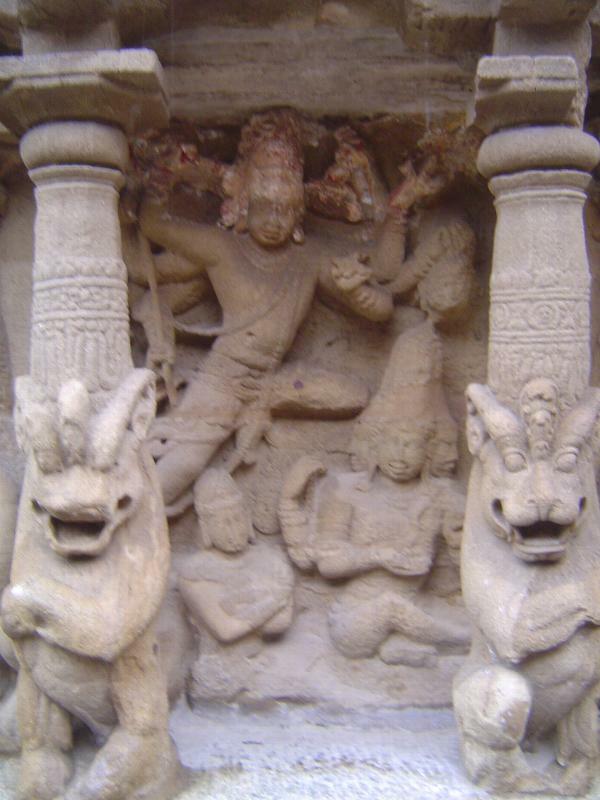 For the south wall, seen here, they include "Durga, Skanda, Bhagavati, Tripurantaka, Gurudarudha-Visnu, Asura-samhara, Nrsimha, Svisnu, Trivikrama, Samudramanthana, Siva-tandava, Siva cutting off the fifth head of Brahma, Kiratarjuna-yuddha, Yogesa, Jalandharavadha, Destruction of Daksa's yajna, Brahma with consort, Tripurantaka, Kalari, Ganataka, Gangadhara, and Urdhvatandava." 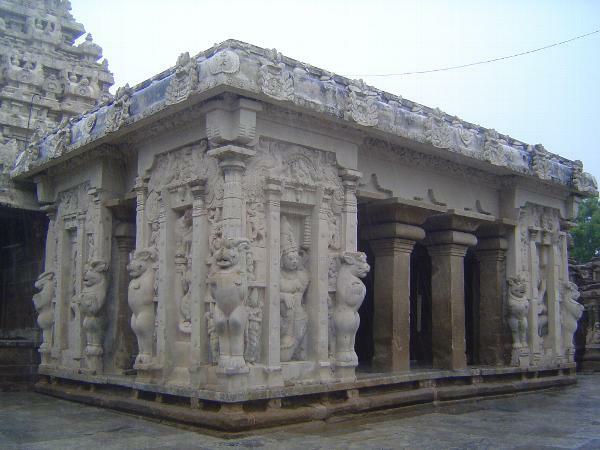 (See Srinivasan's discussion of this temple in The Encyclopedia of Indian Temple Architecture, p. 63). 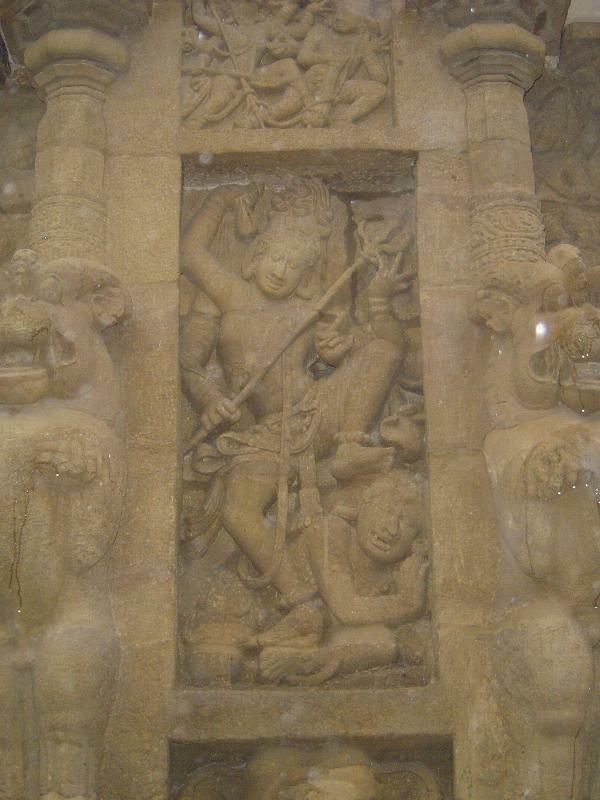 Close-up of the image in the left-hand temple. And the one on the right. Ravana getting his just deserts? 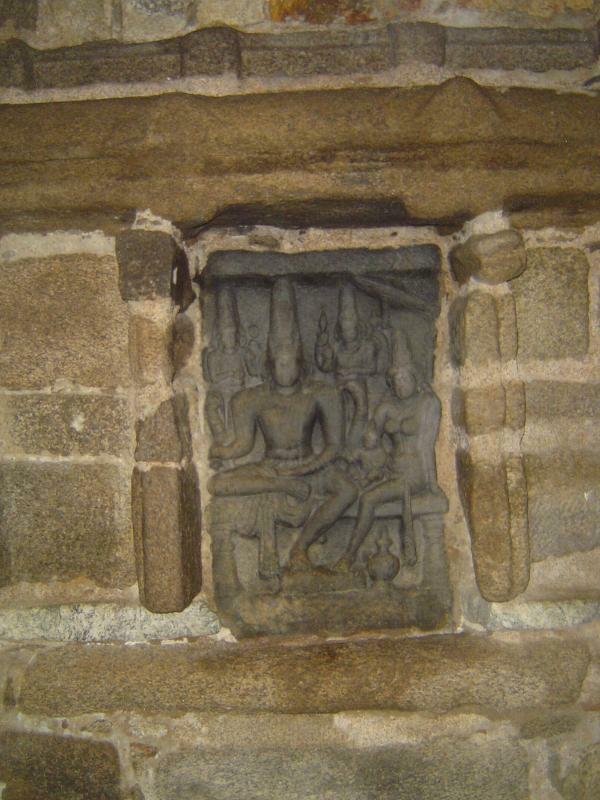 Built into the back or west wall is a Somaskanda or family portrait of Shiva with wife and child. 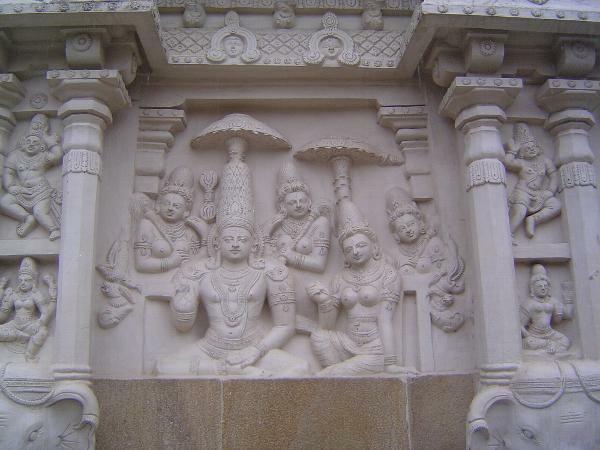 Such portraits originated with the Pallavas.